I just finished pulling up a chair, enjoying a cup of tea and learning from two delightful sisters what life was like over the past 100 years. It sure felt like that’s what I did watching the superb staging of Emily Mann’s play Having Our Say at Hartford Stage. 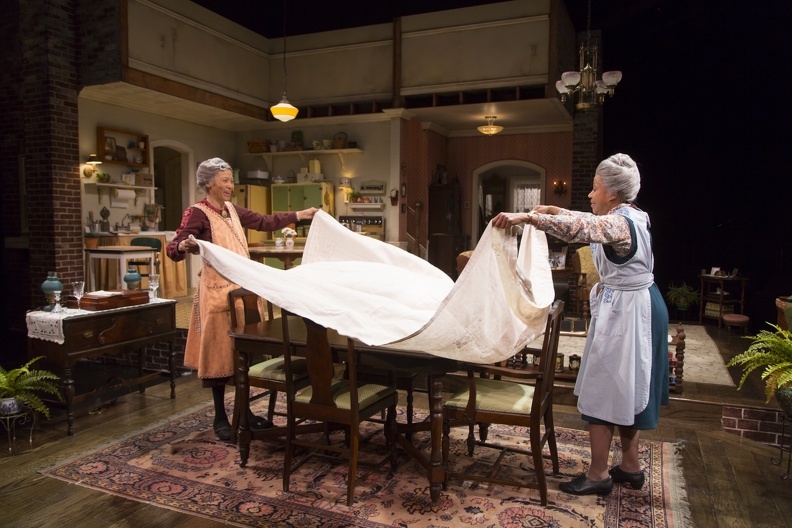 The production, directed by Jade King Carroll, was presented earlier in the season at Long Wharf Theatre, and lets two centenarians, Bessie Delany (Brenda Pressley) and Sadie Delany (Olivia Cole) have their say about growing up the daughters of a former slave, living through the Jim Crow laws in North Carolina, the Civil Rights movement and just about anything else they want. The two women were real. Mann adapted their 1993 autobiography “Having Our Say: The Delany Sisters’ First 100 Years” with Amy Hill Hearth and the show was nominated for a number of Tony Awards when it premiered on Broadway in 1995 (Baikida Carroll’s original music is used here). The sisters are a close as can be, even if they are very different in personality. Bessie, a pioneering woman who became a dentist, is hot-tempered, quick to speak and will let you know exactly what she thinks about the unfair and racist treatment she has received over the years, especially from Rebbies – racist white males. “The darker you are, the harder it is,” she tells us. Her bluntness is balanced by former schoolteacher Sadie’s patient and forgiving spirit. One thing they share in common is an appreciative and abiding love for their parents. Their father, a teacher, became the first African-American bishop in the Episcopal Church and their mother, a college-educated woman, worked outside the home while raising their 10 children. They realize now that they had a privileged life growing up compared to most African Americans. They invite us in to their Mount Vernon Home (meticulously created by Alexis Distler with projections of photos enhancing the storytelling), cook up some delicious-smelling food to celebrate what would have been their father’s birthday (the audience complained of hunger at each of the two intermissions taken in this two-hour, 15 minute play) and reflect on their lives. It’s a combination of history, personal insight and humor that make for a satisfying look at the triumph of human spirit. Both actresses give compelling performances, portraying women much older than themselves, of course. We see the stiffness in getting around, the tension between them when there is conflict, the deep love and affection of each for the person who has loved and known them the longest on earth. · A heartfelt rendition of “Amazing Grace” by Bessie. · Loving their country even if it didn’t always love them back. · The secret of their longevity: never having husbands to worry them to death. Having Our Say runs through April 24 at Hartford Stage, 50 Church St., Hartford. Performances are Tuesday, Wednesday, Thursday, and Sunday at 7:30 pm; Fridays and Saturdays at 8 pm; Saturday and Sunday at 2 pm. 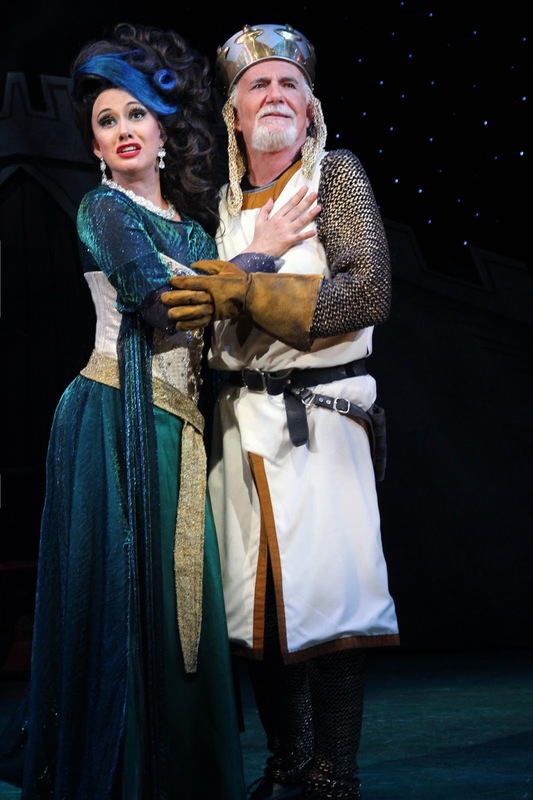 Tickets are $25-$85: 860-527-5151; www.hartfordstage.org. Additional credits: Costume Design by Karen Perry, Wig Design by Carol “Cici” Campbell, Lighting Design by Nicole Pearce; Sound Design by Karin Graybash, Production Design by Paul Piekarz. 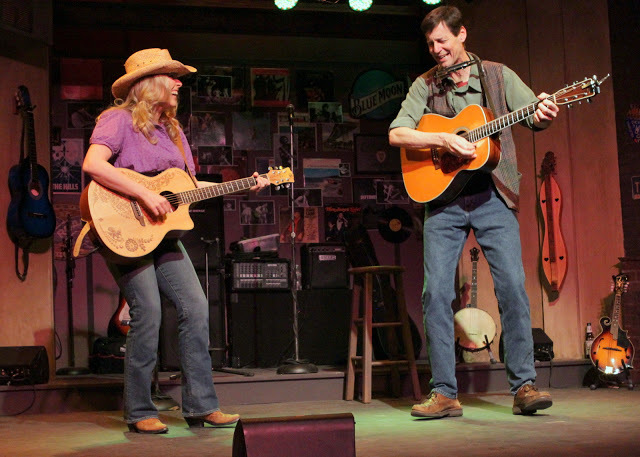 Open Captioned Performances -- April 17, 2 and 7:30 for patrons who are deaf or have hearing loss. FREE with admission. Audio Described Performance April 23 at 2 pm for patrons who are blind or have low vision. FREE with admission. The Mark Twain House & Museum today announced it is postponing its 5th Annual Writers Weekend, originally set for April 15-17, 2016. The new dates are September 23-25, 2016. Those who registered for the April weekend will receive full refunds, but are still invited to attend the Saturday, April 16th 6pm Conversation with Larry Kramer free of charge. For more information contact Jennifer LaRue, Director of Writing Programs, at Jennifer.LaRue@marktwainhouse.org or 860-280-3147. The cast of Cymbeline. Photo © Carol Rosegg, 2016. 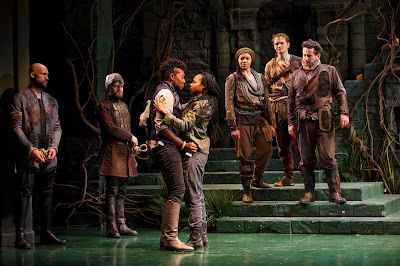 When I think of Cymbeline, William Shakepseare’s tale of tragedy and love in Roman-occupied Britain, I don’t usually laugh, but I chuckled quite a bit through Director Evan Yionoulis’ gender-bending interpretation at Yale Repertory. 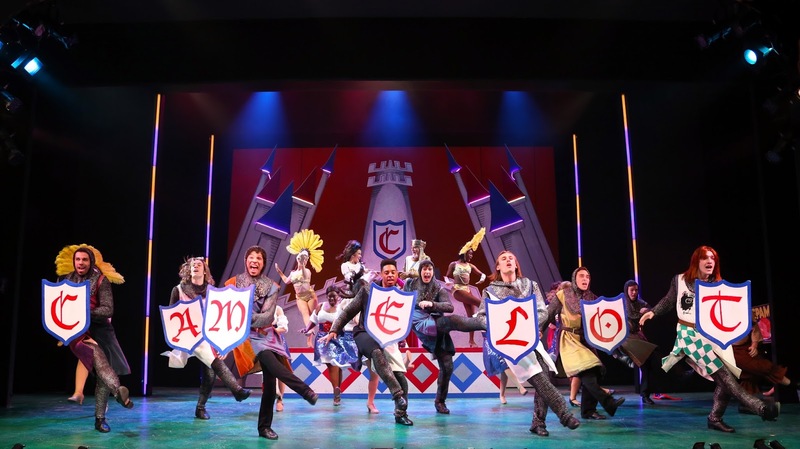 I hope the humor was intentional, because it made what usually is a very long, soporific play with its ridiculous “let’s-wrap-it-up” ending quite interesting. Lines delivered with fresh insight bring large belly laughs from the audience – especially during that insipid climax – and make for an entertaining experience. Also unconventional is Yionoulis’s decision to switch genders for a number of the characters. For most of them, the change remarkably is not noticeable. 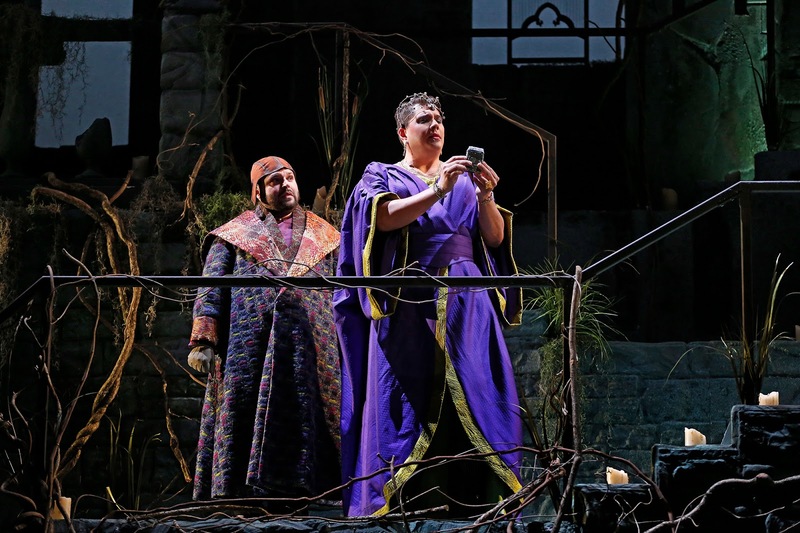 Kathryn Meisle is a fiery King Cymbeline, who is angered when his only heir and daughter, Imogen (Sheria Irving), marries for love without the king’s permission and banishes her new husband, Posthumus Leonatus (Miriam A. Hyman). Finding himself in Italy, Posthumus meets conman Iachimo (Jeffrey Carlson) and in a bragging fest, declares that no one could woo his fair Imogen from him. Iachomo pulls off a deception that convinces Posthumus his wife has been unfaithful and he orders his servant, Pisanio (a solid Christopher Michael McFarland) to kill her. Instead, Pisanio spares her and dressed as a boy named Fidele, Imogen ends up serving Belarius (Anthony Cochrane), who also had been banished by Cymbeline years ago, and his two sons (Monique Barbee and Christopher Geary whose identities are a secret known only to Belarius. Meanwhile, Cymbeline’s ambitious and calculating queen (Michael Manuel) plans to put her own son, Cloten (also Geary), who has his own lecherous designs in Imogen, on the throne. Some sword battles with angry Romans (excellently staged by Fight Director Rick Sordelet), a beheading, a Romeo-and-Juliet-like faked death, multiple confessions and true love all take center stage before the end of this comic tragedy, which is the funniest I ever have seen. And that’s my short version of Yionoulis’s two-hour-45-minute condensation of the Bard’s play (which sometimes can have a running time of almost four hours). Where the gender bending stresses our imagination too much and breaks is in the casting of hefty and tall Manuel as the queen. Looking like a ridiculous drag queen in a flowing robe with heeled boots, his entrances are greeted with laughter, as is much of his dialogue, whether it is funny or not. There really isn’t a purpose to this humor, however, and it distracts from the rest of the production which is nicely staged on Jean Kim’s soaring and brooding stone set with brambles entwining it much as darkness grips this family. Multiple levels allow for intriguing staging and for the use of superb projections designed by Rasean Davonte Johnson. The materialization of some apparitions is one of the most spectacular and wondrous effects, aided by revealing light design by Elizabeth Mak. Original music and sound design by Pornchanok (Nok) Kanchanabanca also adds to the mood. 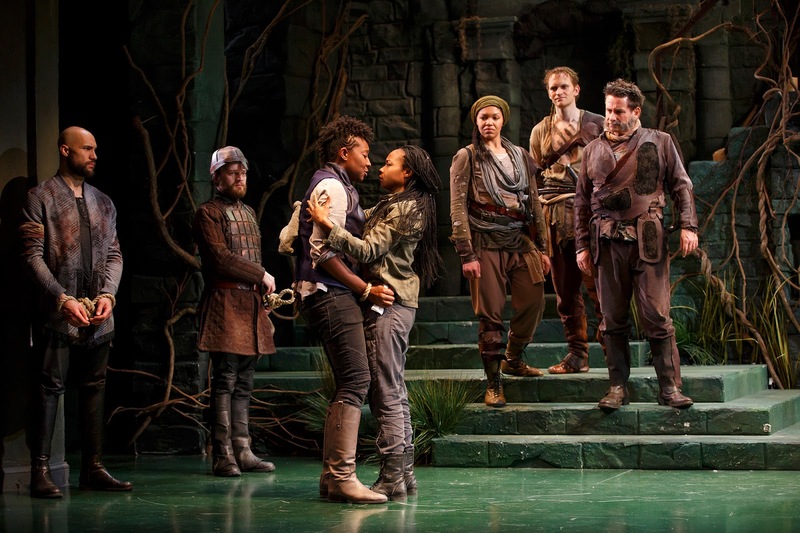 Cymbeline reigns through April 16 at Yale Rep's University Theatre, 222 York St., New Haven. Performance times vary. Tickets $20–$99: www.yalerep.org; (203) 432-1234. Student, senior, and group rates are available.